The next meeting of the Board of Directors of OAO Tatneftekhiminvest Holding was held today in the House of the Government of the Republic of Tatarstan (Kazan). The meeting was held by the President of the Republic of Tatarstan Rustam Minnikhanov. During the meeting, a number of innovative proposals were considered for implementation on the territory of the republic. Thus, an annual list of mutual supplies of hydrocarbon raw materials and petrochemical products by enterprises of the oil and gas chemical complex of the Republic of Tatarstan, including small and medium-sized businesses (SMEs), was reviewed and approved for 2018. According to the general director of OAO Tatneftekhiminvest-holding Rafinat Yarullin, the plan for 2017 is fulfilled. According to the list of 2018, more than 330 items have been agreed upon, it remains to conclude contracts. According to some positions, it is decided to conduct deliveries for small and medium-sized businesses through electronic bidding. The general director of OAO Tatneftekhiminvest Holding named the most scarce positions – ethylene, laprols, isocyanates, linear alkylbenzenes. According to him, “these are projects for consideration in the near future, the work of many enterprises depends on them”. 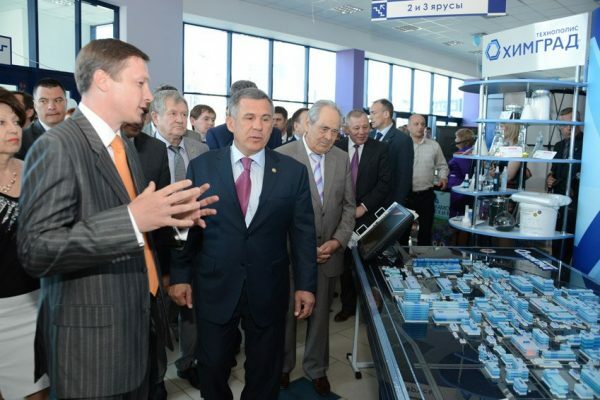 Rustam Minnikhanov thanked the Tatneft and TAIF groups as the largest suppliers. He reminded that this issue is being considered in the context of the task to bring the processing of petrochemical products produced in the republic to 30%. At the same time, it is necessary to develop a market for consumption of new products. For this, according to Rustam Minnikhanov, it is necessary “to create an environment, train people, create an infrastructure.” Each redistribution gives added value and revenues to the regional budget, Rustam Minnikhanov reminded, in addition, a stable circle of local consumers of industrial giants is created. “As a result, we from the largest petrochemical center can become the largest producers of further redistribution products, because we have polymers that are not available in other regions,” the President of Tatarstan said. Another advantage he called the creation of new jobs instead of being cut in the process of automation of production. They can be created within the territories of accelerated social and economic development and on municipal sites. A huge work in this regard is being carried out by oil workers, said the President of the Republic of Tatarstan. Rustam Minnikhanov recommended signing the supply contracts as soon as possible, to conduct them in the most electronic form, promptly and transparently. He also appealed to the heads of Tatneft and TAIF companies to take this process under control. One of the topics of the meeting of the Board of Directors of OAO Tatneftekhiminvest Holding was the development of the National System of Qualifications (NSC) of the petrochemical, chemical and biotechnological complex using the example of Tatarstan. The speakers were Maria Ivanova, General Director of the Association of Employers “Russian Union of Chemists” (RSH) and Andrei Glazkov, Head of the Personnel Department of PJSC “Tatneft”. Active development The national qualification system has been received in Russia since 2012 after the introduction of mandatory professional standards in the country, Maria Ivanova recalled. She is also an expert of the National Council for Professional Qualifications of the President of the Russian Federation and the Deputy Chairman of the Council for Professional Qualifications of Chemical and biotechnological complex). The tasks of the NSC include the development of professional standards, the creation of a national handbook of professions, the updating of educational standards and programs, the establishment of centers for independent assessment of qualifications. The structure of the NSC includes branch councils, today there are 30 of them. One of them is the SPK of the petrochemical, chemical and biotechnological complex created in 2016. Thanks to the active position of the organizations of Tatarstan, the working groups of the SEC of the chemical and biotechnological complex are almost one third of the republic’s representatives, said Maria Ivanova. The success of the development of the qualifications system, she said, is largely due to the participation of such advanced high-tech companies as Tatneft, TAIF, Nizhnekamskneftekhim, Kamsky Polymer Materials Plant, and KNITU-KHTI. It is planned to create a regional methodological center that should determine the lists of professions taking into account development strategies, update or develop new professional standards, ensure their implementation at enterprises and harmonize with the education system. The CPC and the RSH have lined up a stable working relationship with the “InnoKam” cluster, Maria Ivanova noted. This allows us to work through a wide range of issues, including the integration of WorldSkills standards, the development of dual training. The Ministry of Economy of the Republic of Tatarstan has carried out work to study the possibility of introducing the NSC through the site of the Personnel Committee of the Innokam Association as a structure uniting representatives of government, educational organizations and industrial enterprises.